Young adults interested in getting to know the people and culture of Estonia along with young participants from many different countries may apply now to join a unique service project hosted by Religious Youth Service (RYS), an experiential service-learning program with a special focus on developing personal leadership and peacemaking skills. From August 1 – 10 2013, young people from a range of countries, religious and cultural backgrounds will gather in the north-eastern European city of Johvi, Estonia for a 10-day Service Project. Johvi, with 11,000 residents, is the capital of Ida-Viru County in Estonia, 31 miles from the Russian border. More than half of the people of Johvi are ethnic Russians or their descendants, who arrived in Estonia during the period of Soviet rule. RYS is organized by the Universal Peace Federation, and different chapters host service projects. 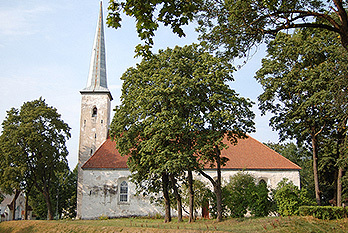 The local partner of UPF-Estonia RYS project will be the Johvi Lutheran Church. The RYS project in Johvi, Estonia will also include educational seminars with presentations on various topics such as “culture of heart,” “friendship,” “team building,” etc. It will involve improvement to the infrastructure of the Johvi Lutheran church building and church grounds and doing work projects for the local community. The project includes a variety of cultural programs and optional sightseeing and sport opportunities. These activities give each participant an opportunity to share with others from around the world while learning through experience about local culture, according to the RYS website, religiousyouthservice.org. And the program allows the opportunity to build new and life-long friendships with people from other cultures and religions, according to the RYS leaflet. The vision of RYS is for young leaders of all faiths to learn the mechanics of serving together for peace. Through living and providing altruistic service within a community, the RYS program demonstrates that it is possible for the global human family to live in peace and co-prosperity. RYS’s educational program emphasizes the need for personal relationships of cooperation to solve the problems and conflicts between people, religions and cultures. Furthermore, woven into the project schedules are a variety of cultural events, educational seminars and recreational activities, which allow participants to experience the amazing cultures of the world firsthand. Enrollment will be capped at 20 people between the ages of 18 to 30 years old. The participation fee per person is €50.00 ($65). (The fee is a contribution towards transportation expenses to and from the project site, towards accommodation, meals and outing programs during the project period. As the name Religious Youth Service implies, young people from various religious backgrounds are welcome to participate, according to the RYS leaflet. All participants will be asked to respect other religious traditions and not to try to convert other participants. The intention is to learn from each other by working and sharing together. If participants have special practical skills or talents, they should be mentioned in the application. They might be useful for certain types of work. Beds or mattresses will be provided, but each participant needs to bring either a sleeping bag or bed clothes. Download the RYS application here.